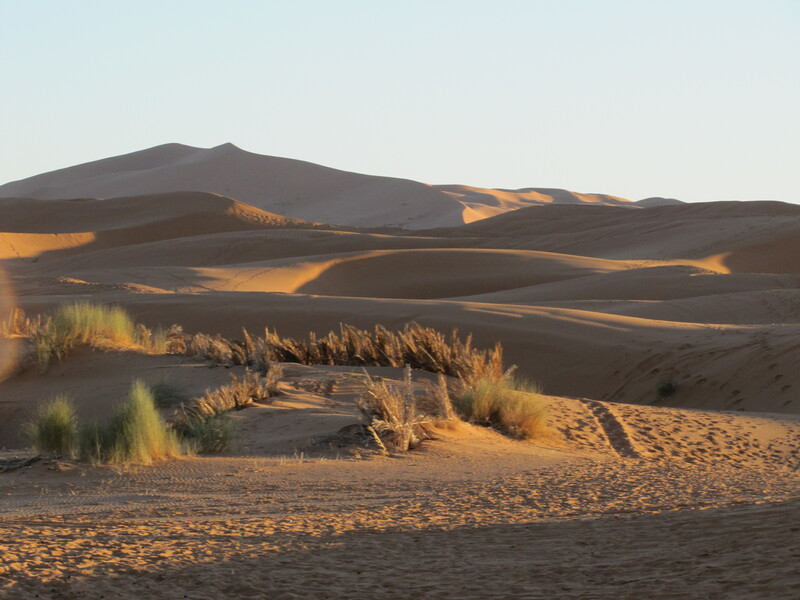 On our tour of Morocco, I took every opportunity to do some birding. It proved to be more difficult than I thought. Because we were with a mini-bus tour group, the opportunities to stop and watch – and photograph – the local birds were somewhat limited. I was constantly distracted by looking at the sights, as well as taking photos of the buildings and scenery, as well as listening to our guide and keeping up with the tour group. In many situations, I could not take the time to get good photos which would have helped with identification later. During our visit to the beautiful Kasbah Ameridhil, I was able to take several photos, and these are featured today. Sadly, they are of very common species, birds I can see almost anywhere here at home in Australia. Above and below, I included photos of two differently coloured Rock Doves. The pure white one above is particularly nice; one does not normally get pure white birds in this varied species. It is more normal to get the plain grey and black colours as in the one below. Another species present in large numbers was the House Sparrow, one of which is shown above. This species appears to be very common in many parts of the world. The last photo (below) is of a White Stork. I saw plenty of this species throughout our tour of Morocco. This pair – I am assuming that they are a pair – have constructed quite a massive nest on a nearby building. The birds are over a metre tall, so this nest would have to be four or five metres tall. They obviously do not get very strong winds in this area – or those birds are very good at constructing a solid nest. You can read about Australian birds I have photographed on my other site Trevor’s Birding. 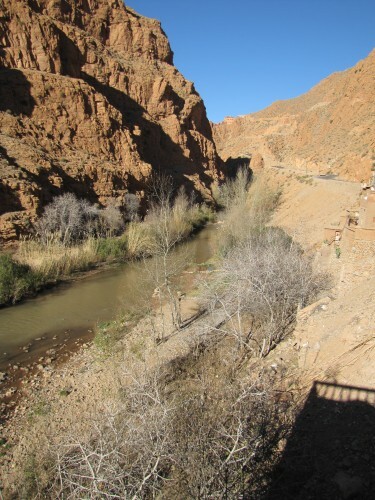 After our long four-hour walk down the Dades Valley – I wrote about that in my last post – we had a delicious lunch in the sunshine on the terrace of the Hotel du Vieux Chateau du Dades. 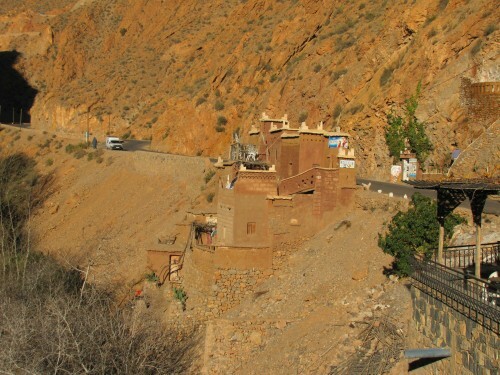 Being at a high altitude in the Atlas Mountains, the air was cold and crisp. Sitting on this terrace (shown in the photo above) we enjoyed the warming sun as we ate. The surrounding cliffs gave a very grand view as we ate. After lunch, most of our touring party decided to walk up the road for half an hour to have coffee near the top of the pass on the road leading north. My wife, daughter and I were too tired from the morning walk to contemplate more walking, so we stayed behind, enjoying the last of the weak afternoon sunshine. After the sun went behind the nearby cliffs, we retreated inside quickly to the warmth of the fireplace at one end of the restaurant. The fireplace was also popular with other guests of the hotel and it was a matter of taking it in turns to get warm. I must say that all in our family really enjoy an open fire. The high cost of firewood makes this increasingly expensive in Australia, but we are pleased that we have a limited supply of firewood on our own property at our home in South Australia. We always have to supplement this with firewood bought from a dealer. All through our six-week trip, I kept a diary, and parts of these blog posts originate from my diary. So in the evenings, I often spent a half hour or so updating my diary. I also decided before leaving home that I would emulate the achievement of a friend of mine. On an overseas trip, she decided to capture her impressions of her journeying by aiming to write at least one poem a day. I achieved my goal. My friend has since published some of these poems in book form. That joy still awaits me – stay tuned because that is in my plans too. Sitting near to the fireplace in our hotel was an ideal writing spot. Chatting with fellow travellers was another delight. The view up the Dades Valley from the hotel terrace. 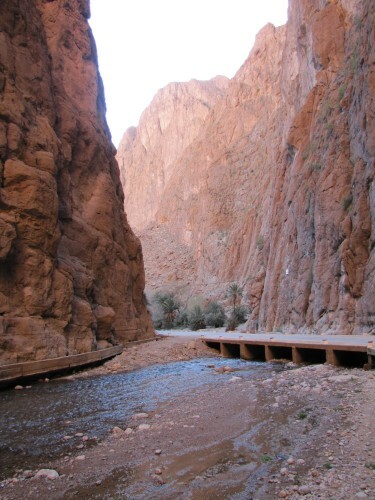 On the next stage of our tour of Morocco, we visited the Todra Gorge. 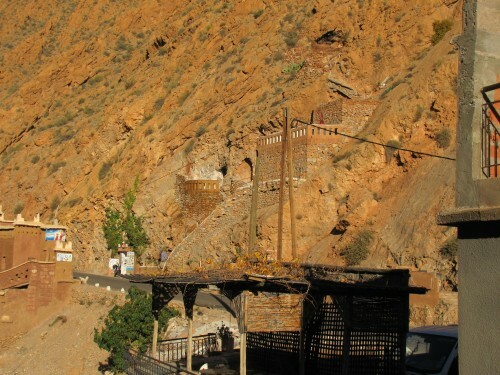 As we moved through this spectacular gorge I took the photo above of the Yasmina Hotel. I was initially amused by the access planks over the water. Not the usual grand entrance one might expect. We didn’t stay in this hotel, nor did we stop for a meal. Just before writing this post I read some very disparaging reviews of this hotel. It seems that the electricity supply is somewhat lacking, or even non-existent. The showers were cold, as were the rooms. The food was also average in quality. On our visit, however, we experienced none of these inconveniences. We enjoyed top quality hotels wherever we went with our tour group. The food was amazing and the people most accommodating and friendly. 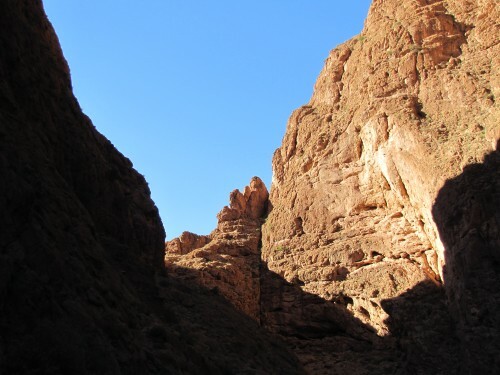 The main reason for our tour to take in this part of Morocco was to experience the spectacular Todra Gorge. 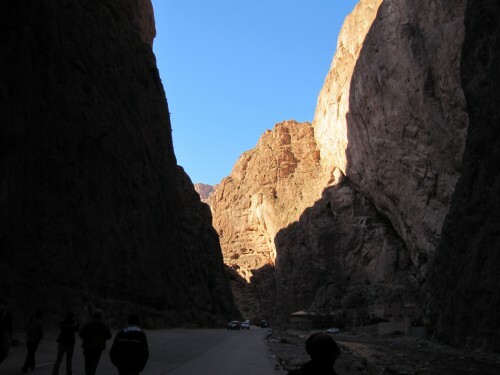 The gorge is shown in the photos below. Although we didn’t walk far into the gorge itself, the views were amazing. I was also intrigued by several rock climbers in the gorge, so it seems that this is another attraction of this area. I also took notice of the variety of traders in the gorge. They had set up their tables at various parts of the gorge. Their wares ranged from carpets to rugs, utensils to kitchen wares, food and drinks, as well as the usual tourist knick-knacks. 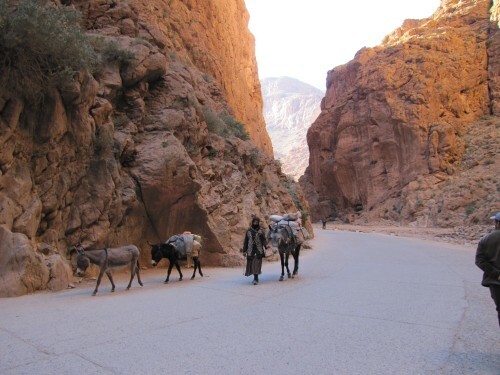 In recent posts here on this site I have written about our tour of Morocco. The visit to this amazing country was certainly a wonderful experience. One of the highlights of the visit occurred on Christmas Eve. 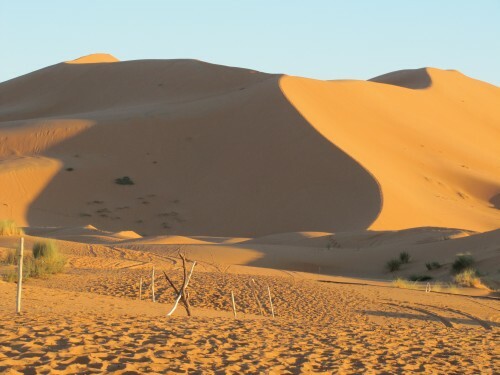 We were taken on a camel ride into the Sahara Desert. 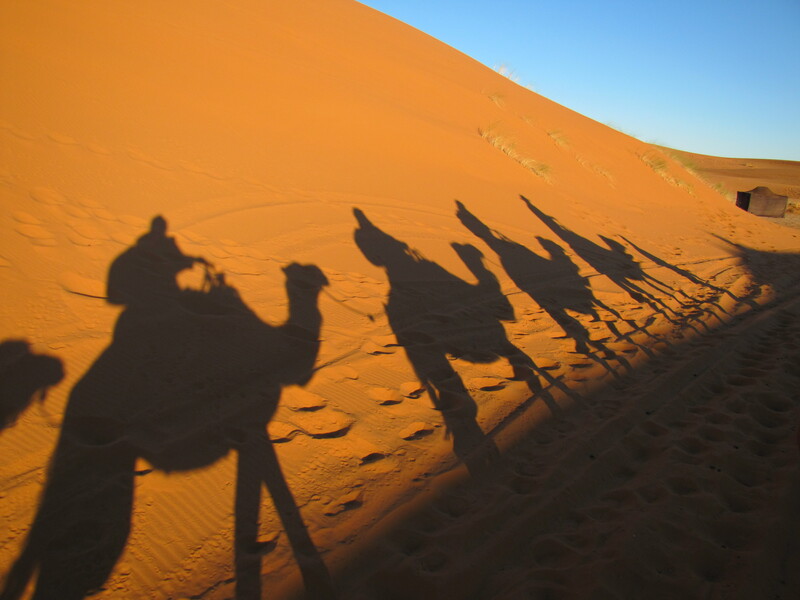 While the experience was unforgettable, I must say that riding a camel is not one of my favourite modes of travel. I find it very uncomfortable. 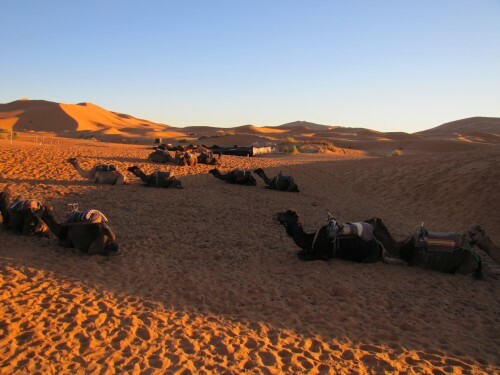 In addition, I also found it hard to take photos while riding a camel and I found that most frustrating. 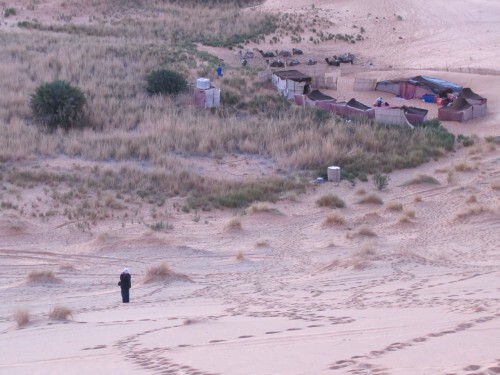 I must say I was quite happy to dismount at our destination, a Berber camp in the desert. Still, despite these limitations, I managed a few good photos while riding a camel. 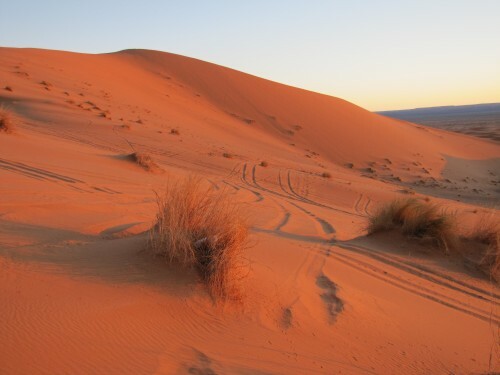 I must say that some of the shots I did manage to take – without falling off or otherwise injuring myself – do show the amazing colours of the desert at sunset. 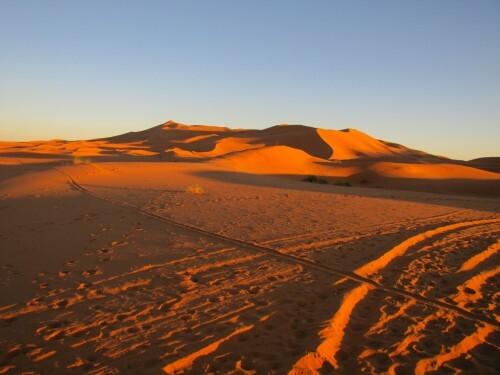 I did take more the following morning as we rode out of the desert. I would like to wish all of my readers a really Merry Christmas. Over recent weeks I have shared photos of our trip in Morocco in December 2011. I have also written about our experiences on that holiday with some reflections on what we experienced. Christmas that year was extraordinarily different for us. At home in Australia we usually go to church on Christmas Day and occasionally on Christmas Eve as well. Then on Christmas Day lunch is a gathering of family and sometimes friends. In a Muslim country like Morocco this festival is not celebrated by many. Just to make things really different, we rode on camels just before sunset into the Sahara Desert (see photos below). 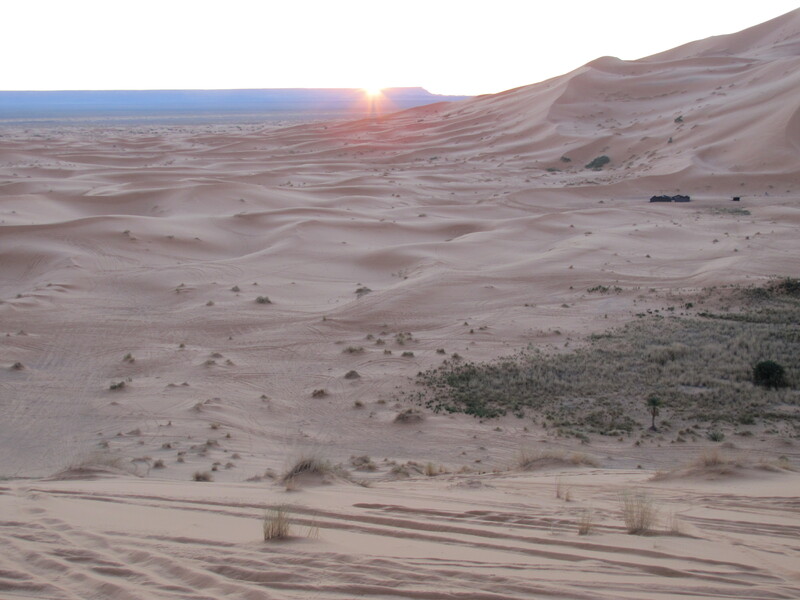 We had a wonderful meal around a camp-fire (it was freezing cold in the desert at night). All we had by way of celebration was a few biscuits and chocolate. The music and singing around the camp-fire certainly made up for the lack of normal Christmas activities we may have enjoyed at home. The lamb tagine the guides cooked for us was also delicious. As the frosty air crept in around us we retreated to our Berber tents to sleep. During the night we felt lucky when one of the local cats decided to creep in and cuddle up on our bed. 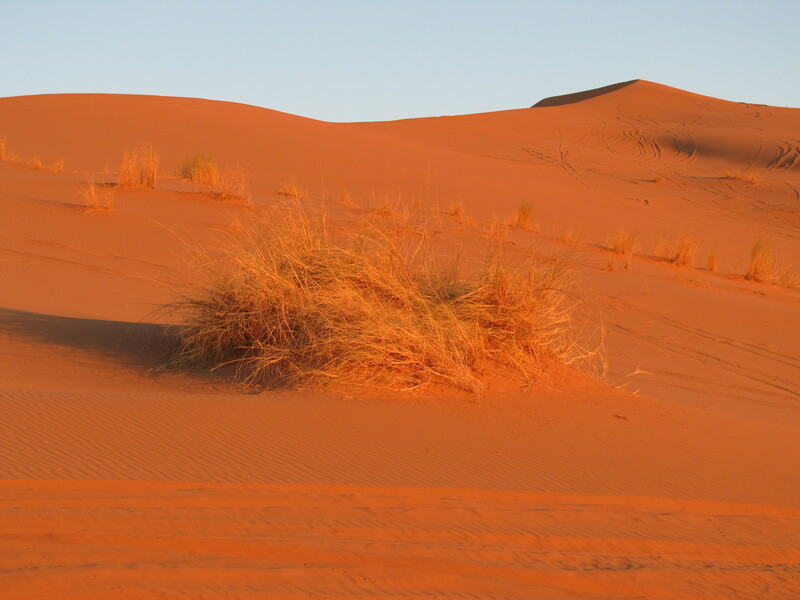 Next morning – Christmas Day – we were awoken before dawn to climb the sand-hill near our tents. 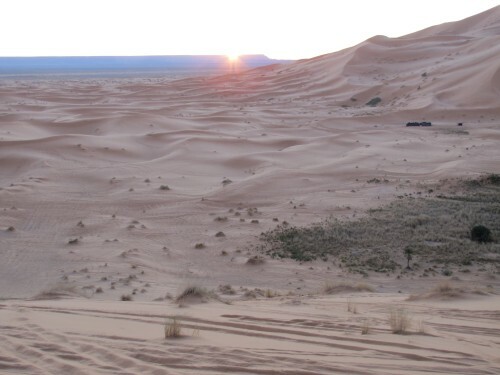 This was so we could witness the sunrise over the desert sands.